A bell tinkles as the door opens and a young Japanese office lady enters the exotic restaurant. An Indonesian man in his mid-30 comes out from the kitchen and welcomes the young lady in Japanese. The man gives the menu to the lady and left her to decide as he goes back to the kitchen. Balinese gamelan music could be heard playing in the background, and the lady is mesmerized by the Bali-style decoration of the restaurant with its table-sitting and floor-sitting area. It honestly feels like a different country. She seems to be surprised with the mouth-watering dishes on the menu, which cause her a hard time to decide. After a few minutes, she decides what she wanted and calls the man to order. Little did she know, she is in Kochi’s one and only authentic Halal restaurant, Bali Jasmin. Bali Jasmine is Kochi’s sole authentic Halal restaurant, serving the small Muslim community here with exotic Indonesian and Indian dishes. The restaurant also serves as a medium to spread the Halal food culture in Kochi. “When people ask ‘Is this halal?’, Insya-Allah, it is Halal,” explained Mrs. Yuyun proudly. 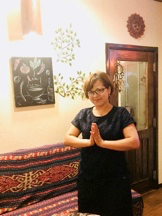 Mrs. Yuyun opened the Bali Jasmin restaurant at Tosayamada in 2015 and decided to open another branch at Obiyamamachi in 2016. Bali Jasmin restaurant is in the business for 7 years, but it was closed for a year after the third year in business due to Mrs. Yuyun personal matter and to focus on the overseas branch in Malaysia and Jakarta. Now she only does her business in Kochi. Bali Jasmin uses ingredients that are planted by Mrs. Yuyun herself. She even orders the chicken and beef from a certified halal supplier. Which is why she is being very confident that the dishes she served is halal. Even some of the Indian dishes here is halal. However, since they need to adapt to the Japanese taste, they also serve pork curry in the Indian dishes, beer and make the recipes less spicy as Japanese people in general, do not like spicy food. To cope with this issue, Bali Jasmin has made a separated kitchen. One side of the kitchen is for serving halal food, and the other is for the non-halal food. Both sides of the kitchen have their own sets of cookware as the tools used to cut or cook non-halal food must never be used to prepare halal food in accordance to the Islamic teaching. In general, all foods are halal as long they do not contain ingredients that are prohibited by the Quran or Hadith. Hadith is the record of words, actions, and the silent approval of the Prophet Muhamad S.A.W and is one of the significant guidance for Muslims besides the Quran. Most people know that Muslims cannot eat pork or drink alcohol/sake. Muslims can eat seafood and eggs but can’t eat non-halal animal-based shortening, mirin and chicken or beef that are not prepared according to the Islamic Laws, because they are not Halal. To summarize, halal food is food that does not contain ingredient made from pig, alcohol, carnivorous animals, birds of prey or foods that include any ingredients derived from such. Many Muslims might have been asked whether can a non-muslim eat halal food or not. Bali Jasmin is a mixed restaurant that serves Indonesian and Indian dishes. The chef for the Indian dishes is a native Indian. Mrs. Yuyun also revealed one of the rules they had in the restaurant. The reason for this rule is so that they can meet up with the family and learn about new dishes in the country. It is also to resupply the ingredient that can only be found in the home country. When asked about the hardship she faces while running a business in two locations, she responds that it is hard as she is the one who cooks for both places. “I want to make sure that the taste is the same in both branches so, I made all the dishes,” says Mrs. Yuyun. Another hardship she faces is managing her workers. Since the restaurant serves Indonesian cuisine, she wishes to employ Indonesian workers. However, it seems that the workers are having a difficult time in adapting to the Japanese custom in the serving of food. This could be a common hardship face by all the ethnic restaurant in a foreign country. As the saying goes, “Home sweet home,” even if they are far from home, just by having a bit taste of home could bring a lot of happiness. But this will bring joy to only a few people. “People who are looking for halal food and restaurant in Kochi will find it very hard in the early days, which is why I started this restaurant” explained Mrs. Yuyun. According to Nippon.com, in Japan, the Muslim population is still relatively small. Most Japanese only have a basic understanding of Islam. However, the views of the religion are frequently tinted by stereotypes and negative images presented in the media. This an issue that many Muslim residents and visitors find worrying. Also, according to the Japan Halal Association, there are about 100,000 Muslims in Japan. And to meet the 20 million visitors target set for 2020 when the Olympic Games come to Tokyo, the government are trying to broaden Japan’s appeal and is trying to make it a more Muslim-friendly through many efforts. Kochi has a small community of Muslims and to have a restaurant such as Bali Jasmin surely does bring a lot of delight to them. But in business content, it will be tough to maintain it as they only have a small amount of customer. They must make a few adjustments in their dishes so that it would also attract the local people as well. Bali Jasmin’s specialties as recommend by Mrs. Yuyun are Nasi Goreng, Ayam Penyet, and Ayam Gicha-Gicha. 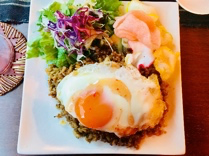 Nasi Goreng is fried rice in the Indonesian language. The restaurant serves a variety of delicious Nasi Goreng such as Nasi Goreng Nenas(pineapple), Nasi Goreng Seafood and Nasi Goreng Ayam (chicken). Which means that the fried rice is cooked with either pineapple, seafood or chicken. Customers can choose whether they want it spicy or not which is a good thing for people who love spicy food. The Nasi Goreng is served with a small serving of fresh salad, a sunny up fried egg, and a sweet yet crunchy keropok. It is different from the usual fried rice that is in Japan. “I was wondering what was so special about halal meat before, “says Tanaka Missan, a Japanese student from Kochi University. “but, it is not something that you need to think too hard about. 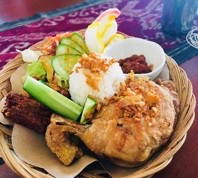 I don’t mind about it much, but after I ate the tasty Nasi Goreng Ayam served in the restaurant, I come to like Nasi Goreng much more,” she chirps as she continues to enjoy her time in the restaurant with her friends. The restaurant is visited by Japanese customers sometimes. Most of them are usually old people or people who have an interest in halal food or Indonesian culture. Also, the restaurant also takes reservations for birthdays and celebration. They will serve a glorious set of dishes that are based on the budget set by the customer. “So far, I am enjoying this job,” responds Mrs. Yuyun on her future plans. “If possible, I would like to open another branch in another city. But I would like to focus on making a more systematic management system first before I do that.” She then added if possible, she wishes to make a “Car Café” (food truck) to cope with fewer customers and as a form of advertisement. “What is important now is to maintain the food quality, give nice service and nice everything to the customers. That is my motto,” says Mrs. Yuyun passionately. I didn’t know this restaurant located in center of city. I didn’t know Halal food, I want to try it by reading this nice article! Looks so delicious, I’m getting hungry. Everything looks delicious! I want to eat some day. i have had nasi goren many times in Malaysia. it was so tasty…. ah,, i got hungry..
also this restaurant is important for Muslim people in Japan i think. Because most of Japanese don’t tell you if there are some stuff in what you can’t eat or not. Its a very interesting and helpful article. It can be a guide to tourist especially to muslim tourist in finding halal food that is both interesting and delicious. At the same time it could also promote Kochi in becoming a tourist destination.